Built by RJ Billings this four bedroom detached house has been extended by the current owners providing three spacious reception rooms, two of which open onto well stocked mature gardens extending to 85 feet backing onto Hartley Country Club. 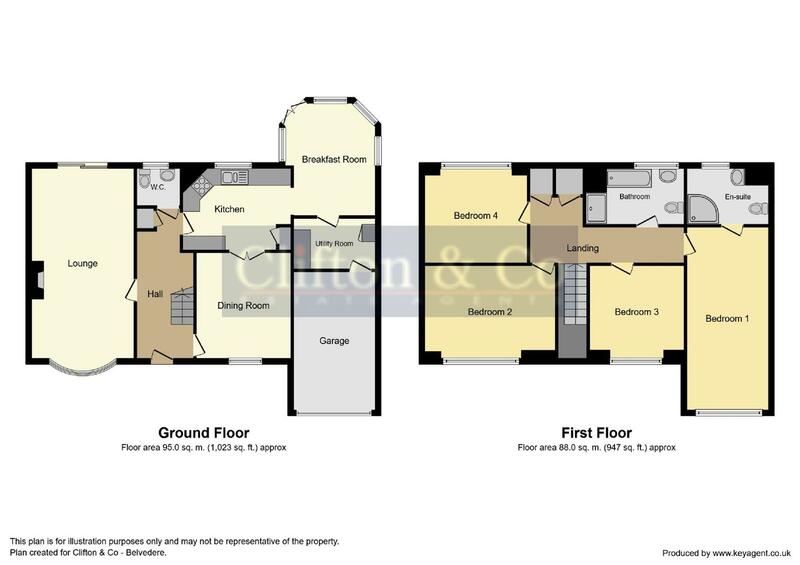 There is kitchen with integrated appliances and ground floor cloakroom/wc with utility room leading to garage. To the first floor there is delightful master bedroom with vaulted ceiling and en-suite shower room/wc, three further bedrooms and family bathroom. Viewing is strongly recommended to appreciate the size and sought after position this property has to offer. Hartley lies in the northern side of the North Downs between Sevenoaks, and Dartford/Gravesend. The thriving village offering local shops and two excellent primary schools, there are several local public houses in close proximity in Hartley & the surrounding villages and Hartley Country Club offering a variety of sporting activities. The village of Longfield offering further shopping facilities and mainline railway station with services to London Victoria. Road links from the area give access to A2/M2, A20/M20, M25 and Dartford Tunnel as well as the Bluewater Shopping Complex and Ebbsfleet International station providing a 20 minute link to London St Pancras. From Clifton & Co proceed up Ash Road, once past the Post Office on your right hand side take the second turning right into Round Ash Way. Follow the road towards the end where the property will be found on right hand side opposite the green. Double glazed door to front. Cloaks cupboard. Radiator. Comprising pedestal wash hand basin. Low level wc. Part tiled walls. Window to rear. 22' 3" x 11' 10" (6.78m x 3.61m) A double aspect room with bay window to front and double glazed patio doors opening onto rear garden. Radiator. 13' 3" x 10' 9" (4.04m x 3.28m) Four windows and double French doors opening onto patio and garden. Tiled flooring to complement kitchen. Radiator. 9' 8" x 5' 11" (2.95m x 1.80m) Double glazed door to side. Work surface with plumbing for automatic washing machine. Gas boiler supplying central heating and domestic hot water. Tiled flooring to complement kitchen/family room. Personal door to garage. Linen cupboards. Inset spotlights. Radiator. 21' 6" x 9' 11" (6.55m x 3.02m) Double glazed window to front. Feature vaulted ceiling with inset spotlights. Wood effect flooring. Radiator. Comprising vanity wash hand basin. Close coupled wc. Separate shower cubicle with power shower. Tiled floors and walls. Inset spotlights. Radiator. 14' 11" x 10' 7" (4.55m x 3.23m) A double aspect room with double glazed window to front and side. Radiator. 11' x 10' 4" (3.35m x 3.15m) Double glazed window to front. Radiator. 11' 9" x 8' 3" (3.58m x 2.51m) A double aspect room with double glazed window to rear and side. Radiator. Comprising panelled bath. Pedestal wash hand basin. Separate shower cubicle. Close coupled wc. Part tiled walls. Tiled flooring. Double glazed window to rear. Inset spotlights. Laid to lawn with flower and shrub borders. Driveway with parking for several cars leading to garage. 16' 2" x 10' (4.93m x 3.05m) Up and over main door. Electric light and power. 85 feet. With wide paved patio terrace leading to gardens laid to lawn. Well stocked with mature flower and shrub and borders. Screening fences and hedges. Garden shed. Ornamental pond. Outside lights. Water tap. We are informed this property is in council tax band F, you should verify this with Sevenoaks District Council on 01732 227000.